Combine coconut milk, evaporated milk, and condensed milk in a pot. Simmer for 5 minutes over low heat, stirring continuously. Add the corn and cornstarch slurry into the pot and stir until thick. About 2-3 minutes. Brush a baking dish lightly with coconut oil. Pour the maja blanca mixture into the baking dish. Leave for about an hour at room temperature. 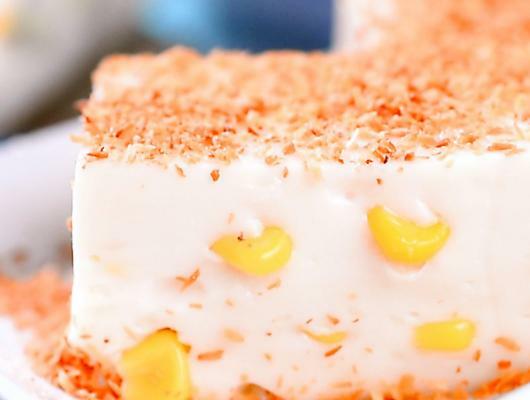 Slice and top optionally with toasted coconut shavings. This sweet coconut pudding is a wonderful treat. The recipe gets its roots in the Philippines and is traditionally served on the holidays and special occasions. Coconut milk provides you with a healthy amount of Vitamins C, E, and B. It has minerals that will promote healthy teeth and the creation of red blood cells. Don’t be concerned about the condensed milk. As long as it is enjoyed in moderation you should be ok and unsweetened versions are available. Condensed milk does offer some health benefits like calcium, potassium, and Vitamin A. So go ahead and enjoy this recipe at your next special occasion.